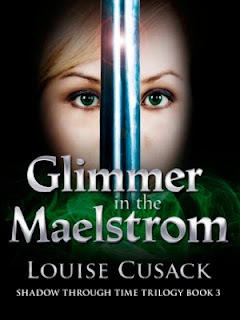 GLIMMER IN THE MAELSTROM is the third and last book from author Louise Cusack in the SHADOW THROUGH TIME trilogy. Princess Khatrene was married to the Dark and gave birth to his child. Now Glimmer, the child is sixteen years old and she has powers which Pagan and Sarah make her hide and keep secret. While they have another child Vandal, who also has guardian powers, for he is the child of a guardian. Glimmer has grown up with extra ordinary powers. For she is the child of The Light and The Dark and she is destined to join the four worlds of water, air, fire and earth together. She goes to Ennae to fulfil her destiny. Will she be able to do it? And will Pagan leave Sarah and Vandal behind to go to Ennae? What will happen when the Maelstrom hits? Will Glimmer survive it? And will Khatrene be able to meet her daughter? I loved this fantasy world created by author Luise Cusack. It's gripping story will keep a reader engaged till late at night!